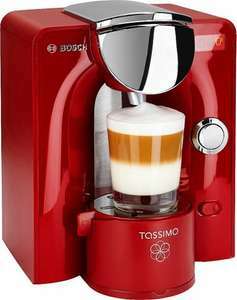 Latest deal for the Tassimo machine at the Tassimo site is the smart looking Red T55 Charmy hot drinks machine for £45 inc. postage. Drinks not included but you get 2x £10 vouchers when you register a new machine. New Times code is: SANTA2014 - Thanks to dave16b (and Traveller for confirming). if any body want to give me a code please would appreciate. Does anyone have a code they don't need and are willing to share? It has a brita filter and it's normally £140, so you save £100 with the code. The Times machine on offer is not actually the one in the picture from … The Times machine on offer is not actually the one in the picture from the OP. (Do you want to change the image to the one on the secretsale link? )This is the machine you get... (but in red obviously! )https://www.tassimo.co.uk/MachineRange/Charmy?category=1355&eshopProduct=950755 It has a brita filter and it's normally £140, so you save £100 with the code. Done. Thanks; it was late! Just ordered and received the conformation email. My first Christmas present bought! Don't blame me, blame HUKD! Just to add; We bought this for the In-laws last time it was on offer (about 6 months ago) and it is a very good machine, and smart looking, for £45. It comes with a Brita filter water tank which you can replace the filter on when its "time's up" if you wish. You don't have to if you don't want the expense. Thanks Martini for posting. After months of looking, I had to buy it because it's red!! Doesn't seem to deliver to the Highlands. Ordered, thanks OP. I love Tassimo, use it every day. I drink the Americano coffees. Man, lots of people have ordered one. It seems perfect timing this deal should show as my wife has been wanting one.